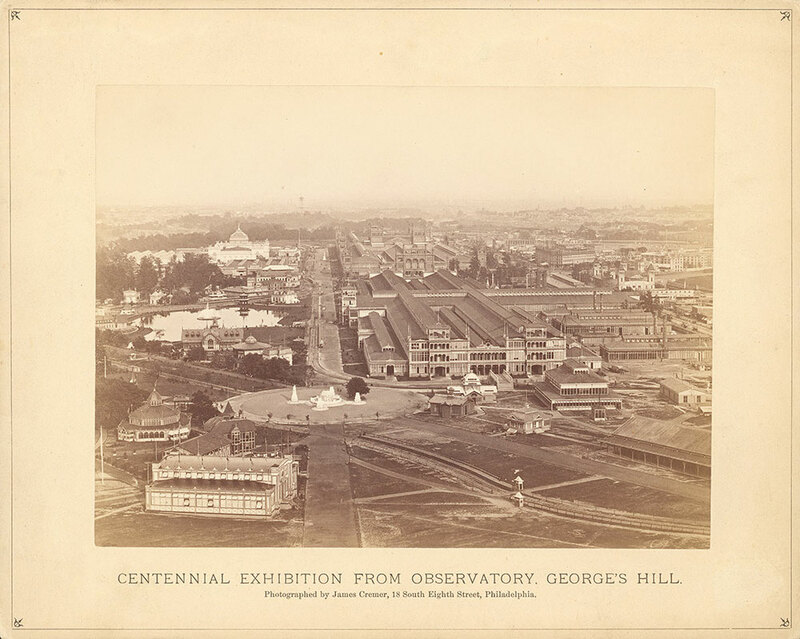 Centennial Exhibition from Observatory, George's.. Title: Centennial Exhibition from Observatory, George's..
Notes: 1 silver albumen print; 15 x 20 cm. Notes: Aerial view of exhibition grounds with buildings, fountains, lake, and railroad tracks visible. Notes: Architects: Catholic Total Abstinence Fountain -- Herman Kirn; Machinery Hall, -- Henry Pettit & Joseph M. Wilson; Main Exhibition Building -- Henry Pettit & Joseph M. Wilson; Liberty Stove Works -- C.C. Phillips; Campbell Printing Press Building -- Alexander B. Barry; Pennsylvania State Building -- H.J. Schwarzmann & Hugh Kafka; World's Ticket Office -- H.J. Schwarzmann; Spanish Exhibition Building -- Alexander B. Barry; Memorial Hall/Art Gallery -- H.J. Schwarzmann; Vermont State Building -- Lamos; Turkish Cafe -- Pierre Montani; Judge's Hall -- H.J. Schwarzmann & Hugh Kafka; Pennsylvania Railroad Office -- J.M. Wilson. Notes: Exhibit titles: Catholic Total Abstinence Fountain, Exhibit #13; Fuller, Warren & Co.'s Store Building, Bldg, Fuller, Warren & Co., New York City, Chicago, Ill., Cleveland, O., and Troy N.Y., Exhibit #14; Machinery Hall, Bldg. #2; Main Exhibition Building, Bldg. #1; Liberty Store Works, Charles Noble & Co., Exhibit #18; Campbell Printing Press Building, Campbell Printing Press and Manufacturing Co., Brooklyn, N.Y., Exhibit #36; Averill Chemical Paint Co., Bldg. #40; Pennsylvania State Building, Bldg. #55; West Virginia State Building, Bldg. #68; World's Ticket Office, Cook, Son, & Jenkins, London, New York, and Philadelphia, Bldg. #84. Notes: Exhibit titles: Spanish Exhibition Building, Bldg. #86.5 [sic]; Memorial Hall/Art Gallery, Bldg. #101; Annex to Main Building (Carriage Annex), Bldg. #106; Vermont State Building, Bldg. #100; Frank Leslie's Pavilion, Bldg. #97; Turkish Cafe, Exhibit #96; Judge's Hall, Bldg. #109; Arkansas State Building, Bldg. #66; Cigar Stands, Bldg. #131; Pennsylvania Railroad Office, Bldg. #113.